With the Clock app on an iPod touch the Clock icon on an iPod nano, or the Clocks option in the Extras menu of an iPod classic, you can display clocks with different time zones, which is useful for traveling halfway around the world (or calling someone who lives halfway around the world). Touch the plus (+) button in the upper-right corner of the display. The onscreen keyboard appears with a text entry field. Start typing a city name on the keyboard and tap one of the suggested cities, or type the entire name and tap Return (or tap Cancel next to the text entry field to cancel). As you type, the iPod touch displays suggested cities. Tap a city (or continue tapping the name and then tap Return), and the iPod touch looks up the city’s time zone and then displays the clock along with the initial clock of any other clocks you’ve added. The clocks sport a daytime face (white background and black hands) from 6:00 a.m. to 5:59 p.m., and a nighttime face (black background with white hands) from 6:00 p.m. to 5:59 a.m. If you add more clocks than can fit on the screen, you can flick to scroll the screen to see them. To remove a clock, tap the Edit button in the upper-left corner of the display and then tap the circled minus (–) button next to the clock to delete it. Choose Extras→Clocks from the main menu and highlight a clock. One or more clocks appear (depending on how many you have created), showing the present time and location. If you have more than one clock and you want to edit one of them, scroll the click wheel to highlight the clock you want to edit. Press the Select button on the iPod to select the clock. The Add and Edit options appear, along with a Delete option if you have more than one clock. Scroll the click wheel to select Add, Edit, or Cancel (or Delete if you have more than one clock already) and press the Select button. If you select Add or Edit, a list of geographical regions appears in alphabetical order, from Africa to South America. If you select Delete, the clock is deleted, and you can skip the following steps. Scroll the Region list, choose a region, and press the Select button. The City menu appears with a list of cities in the region in alphabetical order. Scroll the City list, choose a city, and then press the Select button. You return to the list of clocks. You now have added a new clock (or edited a clock if you selected the Edit option). On an iPod nano, you can pick a clock face that shows the time in London and Tokyo below your time zone. Tap Settings→General→Date & Time to show the Date & Time screen, and then tap Clock Face. A set of clock faces appears — flick up and down to see them all. Tap the clock face that shows London and Tokyo time underneath the regular time. After choosing this clock face, the World Clock option appears on the Date & Time screen. 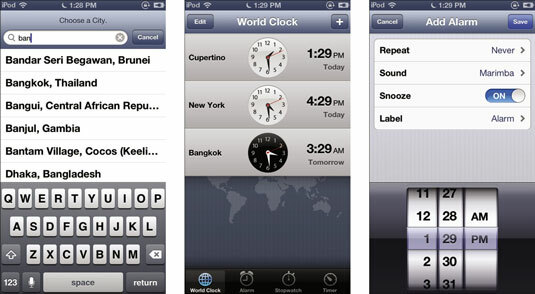 Tap World Clock, tap London or Tokyo to change the London or Tokyo clock, and the Time Zone screen appears. Tap the time zone on the Time Zone screen, and then tap a city to set the time zone for the clock.